GIGABYTE, Corsair, and Intel joined forces a couple of weeks ago to show off its latest (and future) products in the beautiful area of Napa Valley. Yes – there was wine to be sipped, as well as a slew of tech products to be taken in. Want to know what’s en route from these companies? Look no further. I am sure that there are more important reasons for this trio of companies deciding to hold a press there, and despite a ridiculous flight to and from the event, I wasn’t about to wine about it. After all, the weather is gorgeous in Napa Valley during the summer (a surprise to no one, I’m sure), and it proved to be a great spot to get people together and geek out over products to come. It’s here where I admit that the “Tales” in the article title is a big fat lie. There are no tales. But how else am I supposed to lure you into an article to talk about products that have already been announced? You see, the main goal of this event was to allow editors who didn’t make it to Computex to be able to check out products in person – and there were many on display. While three companies helped put this event together, there’s little doubt that GIGABYTE was the one that spearheaded it, and it’s not hard to see why: it had a lot to talk about. 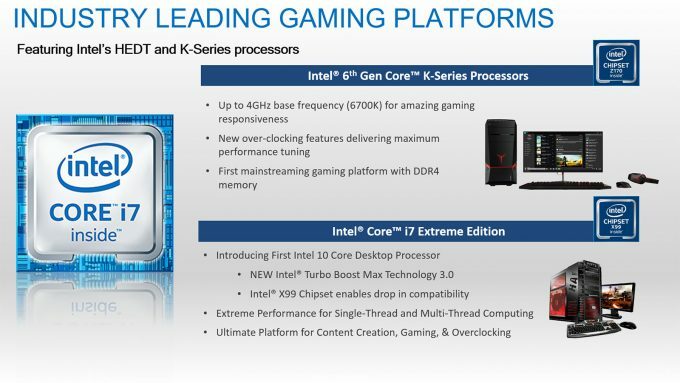 As this event came not long after Intel launched its Broadwell-E series of processors (we still have an article en route – don’t worry), that became a focal point during the company’s presentation. Before GIGABYTE got into the fun stuff, the company’s Business Development Manager Leon Chen gave us a brief overview of how far along the company has come. I don’t have specific statistics to share, but at this very moment, the company is as big as it’s ever been, and its portfolio as diverse as it’s ever been. GIGABYTE isn’t just about motherboards and graphics cards; it also develops mini-PCs, peripherals, and even Thunderbolt docks! I want to talk about the latter first, because as inane as they seem, Thunderbolt docks have a ton of potential. While the company hasn’t confirmed when such products would hit the market, it had a handful of models on display, including one that takes one Thunderbolt 3 port and turns it into dual 10 Gbps Ethernet ports. Another dock offered a more full-featured assortment of ports, enabling someone with a notebook that has just few ports (but at least one Thunderbolt port) to suffer no shortage of functionality. One of the coolest products shown off at the event was GIGABYTE’s upcoming BRIX Gaming PC. By now, you’ve likely seen what the company’s BRIX mini-PCs look like, and they don’t look like this. The gaming model is much taller, housed inside an aluminum chassis, and packs in an NVIDIA GeForce GTX 950. This PC is expected to launch later this year, at which point the pricing will be available. We’ve been seeing a couple of mini-PCs like this targeting gamers, and I hope we continue to see more pop up. They might not have the horsepower some enthusiasts demand, but for those who are content with 1080p gaming, a PC like this would look fantastic next to a computer monitor. GIGABYTE spices things up here with a large LED that sits at the top of the exhaust – it looks great. While the GTX 950 is a capable enough GPU, I really do hope to see an update in the future. GTX 1060, maybe? Laced around this press event were GIGABYTE motherboards out in the open, and in each test PC. The company recently released a new series called Designare which looks to pour on as many features as possible – and of course, look stylish. The X99-Designare EX in particular is spattered with RGB LEDs so that the motherboard will look awesome regardless of what the rest of your build looks like. Have a green theme going? Adjust the board to match. In the mood for hot pink? Easily done. In addition to updating its hardware, GIGABYTE has vastly overhauled its EFI on these latest motherboards, improving ease-of-use, as well as functionality. For those who don’t like to dig too deep into a BIOS, the company’s “Easy Mode” might be appreciated. It’s an EFI start screen that shows all important metrics front and center, and lets you quickly customize some important features, such as power profile and fan control. I have yet to give this EFI a test drive, but will be doing so soon. Last, but not least, GIGABYTE showed off its latest high-end GPU, the GeForce GTX 1080 Xtreme Gaming. I admit that it’s become hard for companies to truly impress me with their GPUs lately, and it’s not something I’d consider their fault. After all, with so much refinement over the years, what else could these companies possibly do to impress? We already have really robust coolers, good overclocking software, and of course, cool lighting. What else can be done? GIGABYTE tells us. With this GPU, the company has adopted what it calls a WINDFORCE Stack 3X design. “Stack” is literal here: the end two fans are placed higher than the middle one, saving on space, and supposedly improving efficiency. Also helping that latter part is the fact that these are large 100mm fans, which almost puts them on par (size-wise) with 120mm chassis fans. The larger the fans, the greater the amount of air pushed, and the better the cooling. In addition to these fans, there are 6 heatpipes underneath that help dissipate warm air quick. There’s more than meets the eye here: GIGABYTE has found that by rotating the middle fan in the opposite direction, air flow is improved even further, and ultimately, the company says that this design improves cooling performance by 10%. That equates to temperatures of around 66°C in “OC Mode”, which pushes the GPU’s clock to 1936MHz (stock GTX 1080 is 1607MHz). If there’s a downside, it’s that unless you have a mammoth motherboard, SLI is going to be a no-go: this card takes up 2-and-a-half slots. It’s also worth noting that GIGABYTE plans to price this card not far off from the stock GTX 1080, at $679. Even better? For $699, a ‘Premium Pack’ can be opted for, which includes a handful of accessories catering to VR users – including a front I/O panel. Corsair began its presentation much like GIGABYTE did, with some (well-earned) gloating. On the memory front, the company says that its focus there hasn’t changed in the least in recent years, and it wouldn’t be happy if it didn’t think it was delivering the best solutions out there. To give an example of how the company is trying to accomplish this: there are currently 380 XMP-certified DDR4 kits on the market right now – 250 of which are Corsair’s. Most impressive. On the topic of memory, the company talked about its upcoming Vengeance LED modules, which are set to come in blue and red colors. If you like what you see, you’ll want to act fast as soon as they appear online: there are only going to be a few hundred copies of each set made available. If you do happen to get your hands on them, you can rest assured that you’ll be able to push them far in overclocking, as the company hand-screens each and every IC for their speed potential. Also promoted here was the company’s brand-new “ML” series fans, which Jamie just wrote about in far better detail than I can. “Magnetic Levitation” is just as it sounds: the fan itself levitates in use to reduce friction and improve life. These fans will prove useful in small and large PCs, able to spin anywhere between 400 and 2,400 RPM. Corsair’s Carbide 400C chassis might not be the newest on the market, but it’s still one of the best-looking, as far as I’m concerned. Even better than the original? The all-white model, which would look fantastic equipped with one of GIGABYTE’s latest motherboards that are coated all in white as well. As you can see in various shots included here, builds with this chassis can look downright amazing. Intel had the least to talk about of the three companies, as it simply doesn’t release as many products as the others do. This event came hot on the heels of the Broadwell-E launch, so that was talked about a little bit, as well as the already-released Skylake processors for mainstream audiences. The company did talk about some trends, though, such as eSports, which is still growing at an almost mind-boggling rate. The company (of course) sees a very bright future in the eSports universe, and notes that many popular games can be played right off of its latest processors just fine, although I’d wager the vast majority of competitive players would want beefier hardware – hardware that Intel couldn’t possibly fit inside of a tiny CPU. Before wrapping up, the company did lay on us some interesting information about Thunderbolt. The company is constantly looking at ways to integrate Thunderbolt into our lives, and a great example of how that could be done is with VR. VR in its current iteration requires the use of many (sometimes thick) cables to be run from the headset to the PC. Wouldn’t it be amazing if all of those could be replaced with a single Thunderbolt 3.0 cable? With 40 Gbps bandwidth, it could be done, but I am truly not sure how likely it will actually be to have it happen. We will have to wait and see. 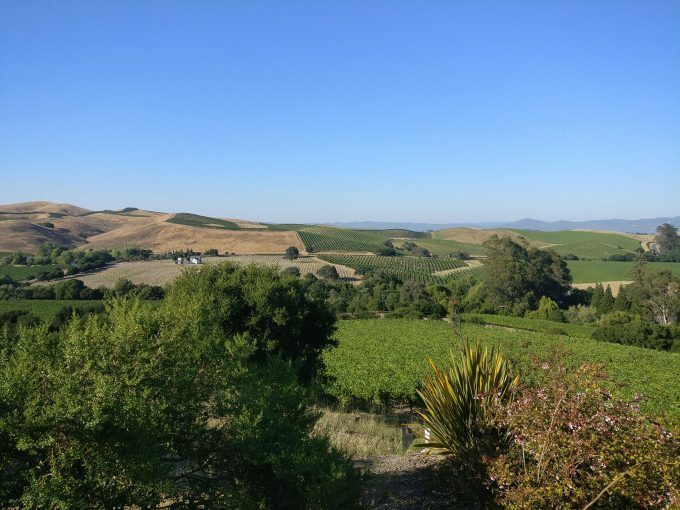 The closest thing I have to a “tale” in this article (sorry again for lying) is that after the event, the trio of companies brought us editors to the incredible Artesa Winery. The winery itself is built right inside of a hilltop, which in itself is impressive, but not as impressive as the unbelievable views surrounding it. I enjoy wine, but I am not what you’d call a “wino”. I almost felt like one after visiting this place, though. Simply being there was somehow inspiring – I sure could do with writing content looking at views like this! Overall, this Napa Valley press event was a lot of fun. It was great to meet up with old friends, meet some new ones, and take a deep breath of plastic, aluminum, printed circuit boards, and of course, wine. And with that, let’s put a cork in it.